Sustainability, or sustainable development, is aimed at improving the quality of life for everyone, now and for generations to come. It encompasses environmental, economic and social dimensions, as well as the concept of stewardship, the responsible management of resource use. Steels are alloys based on iron. Depending on the desired properties – such as strength, ductility, and stiffness – a multitude of other elements can be present in small amounts. The variety of steels is not only defined by chemical composition, but also by a variety of micro structures on a nano and sub-nano scale. This leads to an impressive range of achievable properties and ensures that there is much scope to continue developing new, innovative, lightweight and high-strength steels. Steel’s combination of strength, recyclability, availability, versatility and affordability makes it a unique material. While the steel industry is energy and carbon intensive, significant progress has been made to reduce steelmaking impacts on the environment. Steel’s versatility and recyclability have also brought about countless innovative steel applications that, when seen from a product life cycle perspective, provide savings that neutralise and often far outweigh the initial material production impacts. Steel is everywhere in our lives and is at the heart of our sustainable future. It is at the core of a green economy, in which economic growth and environmental responsibility work hand in hand. The steel industry of present day promotes zero waste, reduces the amount of materials used, and encourages the reuse and recycling of materials, all fundamental advantages of using steel. This offers a markedly different approach and outcome to the “take, make, consume and dispose” economic model which the world has been used to. Present day steel industry believes that sustainable development must meet the needs of the present without compromising the ability of future generations to meet their own needs. Within this, a green economy delivers prosperity for all nations, wealthy and poor alike, while preserving and enhancing the earth’s resources. Steel is produced under controlled conditions. There is little or no construction waste. By-products which are produced during steelmaking are used either within the steel plant or by various other industries. Continuous innovation in production practices and methods of producing steels has provided a permanent reduction in energy used and emissions. The increasing use of used steel (scrap) in the production of new steel creates less and less need for the raw materials (iron ore and coal). Methods for the mass production of steel have been used for over 150 years. In this time, steel has become the material of choice in many applications that make our daily lives possible. Steel occupies this position because of its versatility, strength and recyclability. Steel can be recycled over and over again without loss of properties. Even steel created 150 years ago can be recycled today and used in new products and applications. Steel is one of the most common materials that people come into contact with every day. Moreover, steel touches everyone’s lives every day around the world, through a large number of consumer goods. There is hardly any object that is being used today that does not contain steel or that is not created with equipment made of steel. It is true to say that if it is not made from steel, it is made using steel. Steel is intimately linked with economic growth and prosperity. It is an essential material, intrinsic to the present day way of life of the people. Steel products help to meet the needs of the society. Steel is a uniquely sustainable material because once made, it can be used, as steel, for ever. It is at the heart of the modern society. It is essential to the technologies and solutions that meet society’s everyday needs – both now and in the future. Steel is central to our current transport systems, infrastructure, housing, manufacturing, agriculture, water and energy supply. It is also critical to the sectors and technologies that enables and drives a green economy. Many of the challenges posed by population growth, urbanisation, poverty reduction and mitigation of natural disasters can best be met by steel. Renewable energy, resource-efficient and energy efficient buildings, low carbon transport, infrastructure for fuel efficient and clean energy vehicles, and recycling facilities – all of these things depend on steel. There are several thousands of different types of steel with different properties, designed to meet the specific needs of end users. Many products in use today were developed over the past 10 years. New steels are being developed every year. Several varieties of steels have been evolved to support housing, food supply, transport, and energy-delivery solutions. Steel’s combination of properties such as availability, cost, durability, strength, and ductility (the ability to be stretched or shaped without breaking) is what makes steel a unique material. Steel’s properties enable it to suit a variety of product applications for which there are no energy and cost-effective substitutes. The versatility of steel is well known. It can be used in applications as diverse as container ships and ballpoint pens. Steel can also be used in a wide variety of environments, including extremes of cold and hot, and in arid or wet climates. People depend on the strength of steel. It is only possible to build skyscrapers because of steel’s strength, rigidity and durability. Similarly, aircraft under carriages rely on steel to perform every time an airplane takes off and lands. Today, everyone is challenged to use resources, energy and materials wisely. Steel helps in meeting this challenge easily. It is made with technologically advanced processes and it is completely recyclable – time and time again – without loss of quality. The material properties of steel make it the ultimate sustainable construction material. Its superior strength-to-weight ratio means a little steel goes a long way, giving architects complete flexibility to innovate and create new and exciting buildings that are a pleasure to live and work in. Low and zero carbon buildings are readily achievable using steel construction. Steel being 100 % recyclable helps to save energy and raw materials, to reduce CO2 emissions and to reduce the waste generated from raw materials extraction. Virtually, all the steel which is being used has the potential to be recycled. Improving the recycling rate of end-of-life steel products as well as product design for recycling can increase further steel scrap quality, and hence steel’s contribution to the environment. It is possible to make all standard steel grades from steel scrap. There is no necessity of down rating the quality of steel made from steel scrap. The new steel made from steel scrap retains its properties and remains suitable for high performance applications. High strength steels have several advantages that can be put to effective use in the product design. High strength and better wear resistance contribute towards making the product lighter and more durable. As a result, they can carry more load, are easier to handle, and incur lower maintenance costs. By making the product lighter saving in steel consumption can even be of the order of 35 %. Products can be made lighter without compromising on the safety standards. An added advantage with the lightweight construction is that it has lower environmental impact. The innovation in the steel industry continues to produce new grades of steel, many of which are thinner but still offer the strength needed for the most demanding product applications. These new steels, called advanced high strength steels (AHSS) and ultra-high strength steels (UHSS), allow steel user to reduce mass of the steel for the same application without compromising on safety standards. The steel products are lighter because they use thinner and stronger steel grades. Today, a large number of steel products are being made from high-strength steels. In case high strength steel is being used for construction purpose, it means smaller foundations, faster construction besides reduction in weight of the steel needed. Once steel is produced, its life cycle is potentially endless since steel is 100 % recyclable, which means it can be reprocessed into the same material of the same quality again and again. Also, it is easily recovered by magnetic separation. The two key components of steel are iron which is one of the earth’s most abundant elements, and recycled steel. Once steel is produced it becomes a permanent resource because it is 100 % recyclable without loss of quality and has a potentially endless life cycle. The recyclability of steel makes it a permanent resource for society – as long as it is recovered at the end of each product life cycle. The infinite recyclability without loss of properties, combined with its strength, versatility, availability and affordability make steel unique. This 100 % recyclability of steel also contributes significantly to the sustainability of steel, as the need for virgin resources is reduced significantly. Recycled steel also entails much lower energy consumption – manufacturing steel from recycled steel scrap requires about a third of the amount of energy needed to produce steel from the raw material of iron ore. Recycling is especially important in a green economy because it conserves valuable resources and prevents useful materials going to landfill sites as waste. There are two main sources of recycled steel (also called steel scrap) namely (i) excess material from steel production and downstream manufacturing (pre-consumer scrap), and (ii) steel at the end of a product’s life (post-consumer scrap). 100 % of scrap from steel production and downstream processing is collected and recycled directly into steel production. Post-consumer scrap has to be collected and prepared (for example by shredding and baling). Because of the high value of steel scrap, there are also economic incentives that help to maintain high recycling levels. Post-consumer steel product recovery rates vary across regions and sectors. Recovery rates differ from recycling rates. For example, while about 85 % of automobiles are recovered for recycling, nearly 100 % of the steel in these recovered vehicles is recycled because of the steel’s magnetic properties and the ease of magnetic separation. In addition to steel industry efforts, there are also joint activities with other metal industries, research institutes and academia to identify losses throughout the life cycle and see how they can be minimized to further improve steel recycling rates. Steel is the most recycled industrial material in the world, with over 550 million tons recycled annually, including pre- and post-consumer scrap. Recycling accounts for significant energy and raw material savings. Over 1,400 kg of iron ore, 740 kg of coal, and 120 kg of limestone are saved for every ton of steel scrap made into new steel. Using recycled material is encouraged as much as possible across all regions. Scrap-based steel accounts for over 30 % of the world steel production. However, due to the long life of steel products and the high demand for steel, today, there is not enough available steel scrap to produce all steel from recycled material. As markets get saturated with steel products, they will return to a recycling path depending on products made from steel, from a few weeks ago as in the case of steel packaging, to vehicles which may last up to 15 to 20 years or infrastructure and buildings which may last up to 50 to 100 years. The economics of recovering material is usually aligned with the price of raw materials, if they reduce in price they are used more and scrap prices drop as well, if scrap is scarce the prices increase. Reuse is the best form of recycling as little or no additional energy is required for reprocessing. The durability of steel also allows it to be reused of numerous products, which is enhanced through proper design. 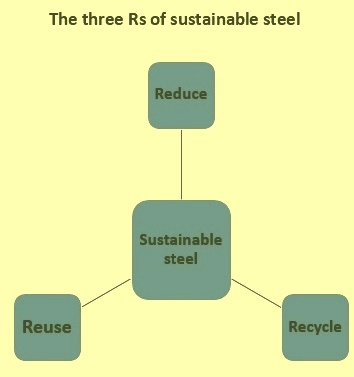 The reuse of steels extends the product life cycle and hence conserves resources. Design is critical in saving resources and enhancing product reuse. Therefore, many organizations and manufacturers of steel and steel product are increasingly designing products for reuse. There are several examples. Some of them are given below. Components for steel construction such as roofing materials, wall elements, and structural beams are reused and increasingly being designed for reuse. The products contained in steel barrels or steel drums are normally consumed in about six months making the life span of the steel barrels as six months in its use. If these drums are reused for 10 times, then that life span can be extended to five years. The steel parts of automobiles that are not damaged from vehicles that have reached the end of their useful lives are recovered and sold by car dismantlers as spare parts for vehicles of same make still in use. Rail track is regularly reused by swapping over the left and right rails on a track. When no longer suitable for main-line use, rails can be tested for cracks and then can be reused on branch lines having lower rail traffic. Rails can also be recapped or redesigned to extend their useful life. Ship breakers while dismantling the old ships recover steel parts that can be re-rolled for reuse. Rebar for construction are often produced in this way. Steel shipping containers are also being reused and converted into stores, site offices and even site rest rooms. Older wind turbines in more mature markets that are replaced with newer, more powerful ones can be shipped to other locations for reuse. Remanufacturing the used wind turbine extends the life of the wind turbine even further. Increased reuse of products always plays an important role in sustaining a green economy. In the future, manufacturers of steel products may also have an important role to play as certifiers of used steel products before they go to market, ensuring the integrity and safety of the product. Statutory authorities can support increased reuse by (i) providing clear guidelines on certification for product reuse, (ii) supporting voluntary codes and standards on product durability within industrial sectors, and (iii) raising consumer awareness about the benefits of reuse. Remanufacturing is the process of restoring durable used products to like-new condition. It involves the disassembly of a product, during which each component is thoroughly cleaned, examined for damage, and either reconditioned to original equipment manufacturer specifications or replaced with a new part. The product is then reassembled and tested to ensure proper operation. It differs from recycling in that the value added during original fabrication, including labour, energy, and equipment expenditures, is conserved. This added value is lost in recycling, which reduces the product to its material components and requires additional labour, energy, and machinery. Remanufacturing also differs from repairing, which is a process limited to making the product operational as opposed to thoroughly restoring it. Remanufacturing extends the overall product life cycle and saves valuable resources. Many steel products lend themselves to remanufacturing, taking advantage of the durability of the steel components. Although mostly invisible to consumers, remanufacturing is already commonplace and will likely become more widespread in a green economy. It offers products that are not only greener, but also less expensive for consumers. A wide range of steel products is already remanufactured. This includes machine tools, electrical motors, automatic transmissions, office furniture, domestic appliances, car engines and wind turbines.